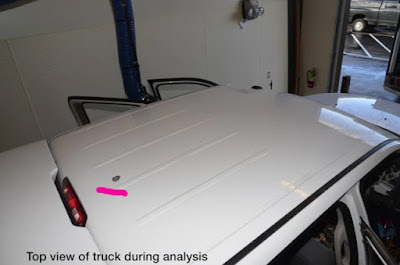 The Deschutes County Police have released "evidence" concerning the murder of LaVoy Finicum and in my forensic investigation, it only proves damning to the police state. The lawyers in the civil suit which will be brought have a billion dollar case here, and they will win it. 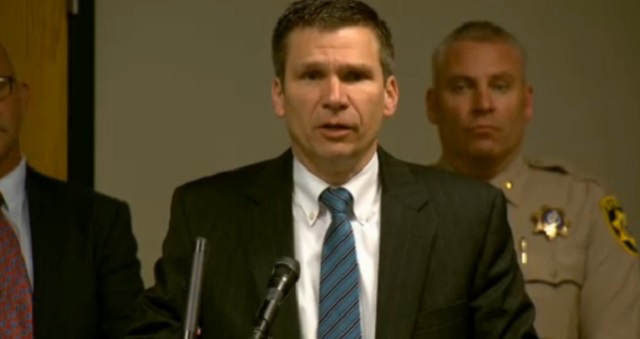 I will first address the 3 firearms which Deschutes stated the located at the scene. It is not illegal to own firearms of this type, in one was a low priced AR 15 type with a very large scope, which would have absolutely no value in self defense, and it was under the seat where it could not be accessed. The second is a 38 type revolver of the bulldog type which was small, and under the seat. The third was the Ruger 9mm which was said found in an interior pocket of LaVoy Finicum's jacket. We have no evidence if Mr. Finicum's fingerprints were found on any of these firearms, which were legal. As Mr. Finicum was pictured with different firearms, it is highly suspect these were his firearms, and we know FBI moles were in the Refuge, so how these weapons appeared, any can guess. We do know from the Shawna Cox iphone recording that Ryan asks at one point, "Where is the gun? ".There was no mention of GUNS. If there was a response, it was not something that engaged Ryan Payne to try and obtain the one gun and none ever was produced as it is a reality, he did not know where the gun was located. Again, Ryan Payne stated ONE GUN. Shawna Cox does not mention GUNS. LaVoy Finicum does not correct Payne about the one gun, and Victoria Sharp certainly was not packing. 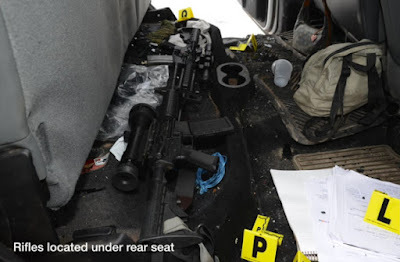 The GUN indicated was the revolver under the seat, not any gun on LaVoy Finicum and not any long rifle hidden under the seat which could not be gotten to. From the forensic evidence, we now can verify some chilling actualities. Deschutes County provided a diagram where the Oregon State Police opened fire on the Finicum vehicle on this blind curve. The measurements point to 100 yards, which is some distance to begin firing at a vehicle which just appeared, and had not shown any aggression at all. We know there were three KILL SHOTS aimed at LaVoy Finicum, as there is a bullet imprint on the front windscreen next to where the driver would be seated. Conclusions are this was the second shot at Mr. Finicum. The first shot is one on the rear passenger side of the driver. This is elongated and was taken at 100 yards which is quite a distance. The shooter or assassin was aiming directly at Mr. Finicum for a head shot on him, but due to speed, the shooter did not compensate for the shot and it struck a glancing blow which almost murdered the passenger Ryan Payne. The second shot was dead on, and was aimed at Mr. Finicums brain, but due to overcompensation on the lead, it struck just right center of the driver side where Mr. Finicum was seated. 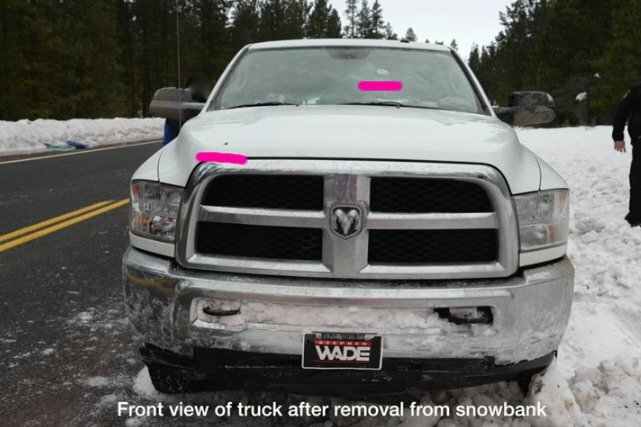 The third shot struck the passenger front hood, as the recoil and moving vehicle would as it neared, provide a crossing shot, instead of the first head on shot at Mr. Finicum at 100 feet as Mr. Finicum was swerving in an attempt to not hit an FBI agent who jumped out in front of his vehicle. The shooter aimed low to compensate and the shot went low. The reality in the above, that protocols should have been followed in attempting to blow a radiator of blow out the engine block first, as the Finicum Group had not shown any aggression. The Oregon State Police though were on a shoot to kill order as is proven by the evidence. It explains why LaVoy Fincum exited his vehicle scolding the police state that if they wanted to kill him, then they should just shoot him, as that is exactly what they were doing, but were missing their assassin mark. This is damning evidence, as it proves there was never any intention to apprehend the Finicum Group. At the previous stop, the police failed to identify themselves, did not attempt to apprehend the Finicum Group, but left them sit for almost 15 minutes to unnerve them, at which point LaVoy Finicum drove off for the Grant County Sheriff to help them. It was at this point that the firing at the vehicle started as that is what is mentioned in the Cox video. The last photo is the FBI top shot photo of their high powered assassin sniper rifle. 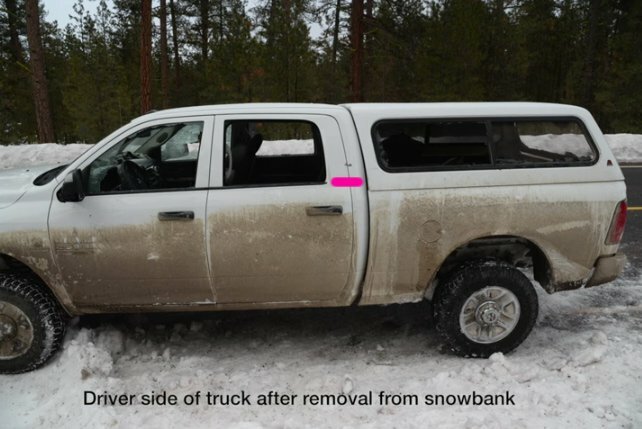 We still do not know if this was from a helicopter or where this agent was positioned, but the vehicle was stopped, stuck in the snow, and Mr. Finicum was outside, surrendering with his hands in the air, and as one can ascertain by angle, Victoria Sharp was in the middle passenger rear, and came close to having her head literally blown off by the FBI, an innocent Christian girl who had done nothing wrong. 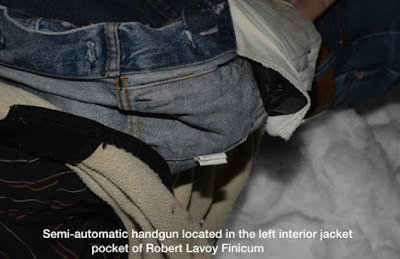 We then arrive at the most troubling photo of all in the handgun which LaVoy Finicum was accused of having, but Mr. Finicum would have had to have used a scissor to access it, as it appears sewn in at the scene, as I have NEVER witnessed a cowboy bluejean jacket with a pants pocket pocket sewn into it ever. The final photo is one of the glaring photos as the focus is by Deschutes that the 9 mm Ruger was found in a "pocket" in Mr. Finicum's blue jean jacket. What is troubling about this photo is that we know that Mr. Finicum was shot in the back 3 times. People who are shot by "citizen killer" ammunition which law enforcement all has, bleed a great deal. Granted the jacket is rolled up to probably hide this gruesome sight, and Mr. Finicum was wearing other winter clothing which might have soaked up the blood, but he laid on that snow for 10 minutes bleeding out, and there should be blood on this jacket. This is a live crime scene photo in Mr. Finicum had been disrobed after death to gain this picture, as one can view the snow under the jacket, and yet there is an absence of blood. There are troubling questions in this, in Mr. Finicum has not had any evidence produced against his corpse, that he owned any of them, when he did own other firearms which he was pictured with. From the shoot to kill orders Oregon State Police were carrying out, from the flushing shots by FBI snipers, and their lies and cover, to the smear spin set upon by Special Agent Gregory Bretzing from before this murder took place, there is more than reasonable doubt that LaVoy Finicum was armed, these guns were his, and the fact is glaring that Mr. Finicum knew kill shots were being fired at him, and he never produced this 9 mm to defend himself. LaVoy Finicum was scolding law enforcement about their assassination attempts, and did not have death wish as has been hinted at, as he surrendered, never fought back, and even after shot he continued to attempt to surrender as he was left to die in the snow. This is a Lame Cherry exclusive in matter anti matter. No one else has reviewed any of this evidence and explained it. 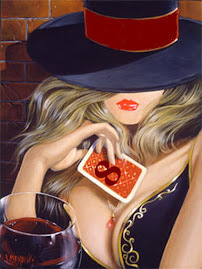 I commend Deschutes County for their uncovering the FBI crimes, but it is not kosher in their calling this a justifiable shooting considering the evidence and lack of aggression of Mr. Finicum, and their presentation of firearms as if they were illegal or a threat, and this covering up of the blood which is or was not there on LaVoy Finicum's jacket, as the focus was on photographing a pistol which appeared, as it fit with the Gregory Bretzing propaganda that Mr. Finicum reached for a gun......which evidence shows Mr. Finicum did not reach for this Ruger, for the simple reason he would have had to use both hands to unbutton his jacket, remove his gloves, in order to retrieve this gun, if it in fact was in his pocket. There is absolutely no reason to place you hand on a gun, on the outside of your jacket when it is housed in the inside pocket of that jacket. The best attorneys in America are going to be receiving a record payday in this murder of LaVoy Finicum. 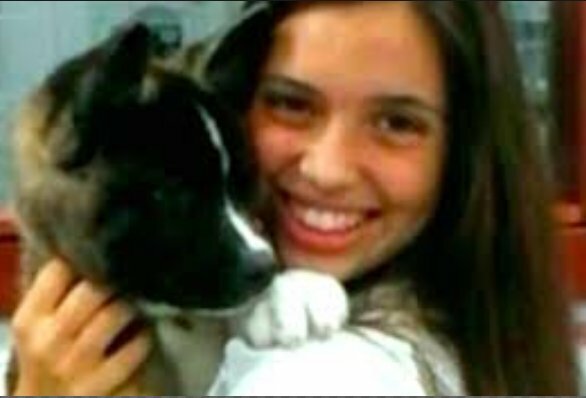 You the taxpayers not only paid for the bullets and the bonuses for this murder, but will pay for the trials of the scapegoats at the FBI in this, and end up paying a billion dollar settlement, as this was murder, heinous murder, planned and plotted murder. What we do not have though yet is the chain of events when LaVoy Finicum was tasered by law enforcement. We already know from the bullet holes that this was intended murder, and now we have to ascertain if the taser was the torture of an old man dying on the snow, to punish him in thee most sadistic way.